Virgin Australia Supercars Championship leader Shane van Gisbergen edged the series’ newest winner Scott Pye in opening practice for the Tyrepower Tasmania SuperSprint. 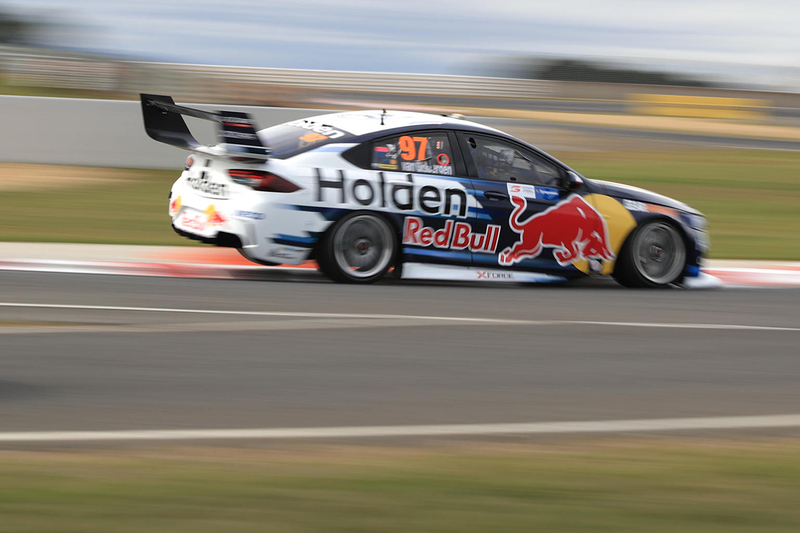 The Red Bull Holden Racing Team driver turned a 50.7894s, the fastest-ever Supercars lap around Symmons Plains, late in the 45-minute session. That was enough to finish 0.0640 seconds clear of Pye, who took his maiden race win at Albert Park a fortnight ago. Van Gisbergen led the way after the initial laps, with a 51.3379s that was shaded by team-mate Jamie Whincup a third of the way in. James Courtney had a spell between the factory Holdens in second, but van Gisbergen had reclaimed the top spot by the halfway mark. Courtney, van Gisbergen, Craig Lowndes and Fabian Coulthard then spent time at the top of the order, the latter pair as a series of new-tyre runs started. On the second flying lap of his run with six minutes to go, Coulthard became the first driver to break the 51s barrier with a 50.9947s. Pye then edged ahead with a 50.8534s in his Mobil 1 Boost Mobile Commodore, but his time at the top was fleeting. Van Gisbergen turned a 50.8192s and then 50.7894s in the final two-and-a-half minutes to finish on top. Pye wound up second ahead of Coulthard, Lowndes, Whincup and Courtney. “I was begging to have some different tyres because the first set we were on were pretty average,” Pye said. “But we stuck to a plan we had going in, Starry (engineer Rob Starr) was adamant we need to get through those before getting onto anything half decent. “At the end it was nice to do that time. I think the car is pretty quick, we were in the 10 the whole run, so we’ll see. Lowndes was also happy with his car following a tough opening two events of the season. “The car is working much better this weekend,” he said. “We have made improvements since Adelaide, then onto the grand prix, and unfortunately we haven’t showed our true potential. Mark Winterbottom was the best of the Tickford Racing Falcons in seventh, while Tim Slade, Scott McLaughlin and the lead Nissan of Michael Caruso rounded out the top 10. McLaughlin’s hopes of moving up the order appeared to be thwarted by a yellow flag at Turn 4 in the final minute, with Courtney and Andre Heimgartner in the run-off. The best of the rookies was the Erebus’ Anton De Pasquale in 14th, three spots ahead of Todd Hazelwood. Nick Percat ventured off track at Turn 6 in his re-liveried Blackwoods BJR Commodore on his way to 19th. Simona De Silvestro wound up 24th, having lost track time early in the session due to an electrical issue in her Nissan, rectified with an ECU change. The results of Friday’s second session, starting at 3pm, shape an all-new ARMOR ALL Qualifying format this weekend. From the combined order, the top 10 drivers will go straight into the second phase of three phases to set the Saturday grid.